GAHS senior Abby Cremeans (2) sinks a two-pointer in front of teammate Maddy Petro (5), during the Blue Angels’ 38-27 setback on Monday in Centenary, Ohio. CENTENARY, Ohio — The margin was the same, but the defenses improved. 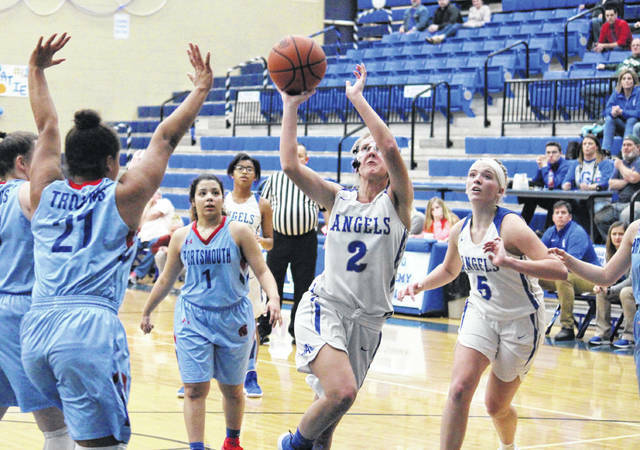 The Gallia Academy girls basketball team — which dropped a 51-40 decision at Portsmouth on Jan. 7 — fell by 11 points to the Lady Trojans yet again on Monday in Gallia County, as PHS spoiled the Blue Angels’ senior night with a 38-27 victory. Portsmouth led 6-2 midway through the opening quarter, but Gallia Academy (6-13, 2-10 OVC) claimed seven of the next nine points and took a 9-8 lead into the second. The Lady Trojans — who sank all-4 of their three-point tries in the second period — scored the first 10 points of the stanza and stretched their advantage to 26-14 by halftime. GAHS was back to within six points, at 28-22, with an 8-to-2 run to start the second half, but Portsmouth claimed six of the final eight points in the third quarter and led 34-24 with eight minutes to play. The Lady Trojans outscored GAHS 4-to-3 in the fourth quarter, capping off the 38-27 victory. 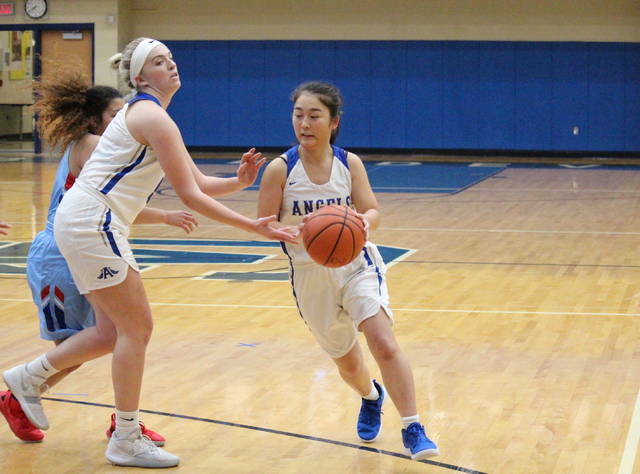 Following the setback, Blue Angels’ head coach Jordan Deel was disappointed with being unable to send his seniors — Abby Cremeans, Katie Carpenter and Hunter Copley — out with a win on senior night, but was pleased with the effort and improvement he has seen with his squad. “We really wanted to get a win tonight against Portsmouth for our seniors on senior night,” Deel said. “Unfortunately that didn’t happen, but with that being said, there were a lot of positives to take away from tonight. Gallia Academy made 12-of-48 (25 percent) field goal attempts, going 6-of-24 in each half. The Blue Angels made 2-of-16 (12.5 percent) three-point tries, missing all-10 in the second half. Portsmouth shot 15-of-34 (44.1 percent) from the field, including 6-of-10 (60 percent) from beyond the arc. Both teams were 50 percent from the free throw line, PHS making 2-of-4 and GAHS making 1-of-2. 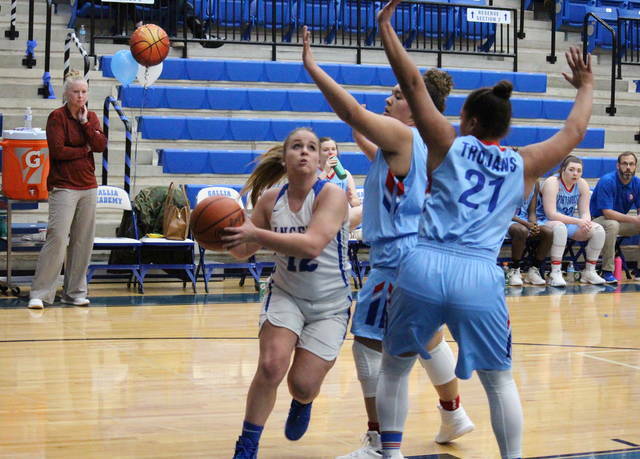 The guests won the the rebounding battle by a 27-to-24 edge, despite the Blue Angels winning the offensive glass by a 16-to-9 margin. Gallia Academy committed a dozen turnovers, three fewer than Portsmouth. The hosts combined for 11 steals, nine assists and a rejection, while PHS came up with 10 assists, six steals and three blocked shots. Maddy Petro led the Blue and White with eight points and nine rebounds, to go with the hosts’ lone block. Brooklyn Hill and Abby Cremeans scored seven points apiece, with Hill earning a team-best four assists, and Cremeans picking up a game-high five steals. Rounding out the GAHS tally were Preslee Reed and Junon Ohmura with three and two points respectively. Hannah Hughes led the victors with a double-double of 17 points and 11 rebounds, also paced the PHS defense with three steals and one block. 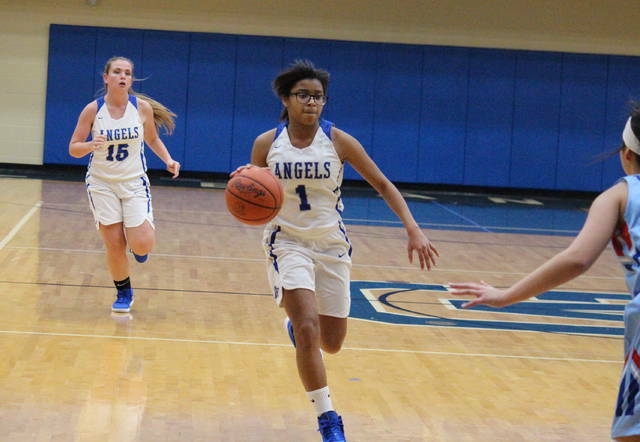 Jasmine Eley tallied 14 points for the guests, Nia Trinidad added three points and four assists, while Jaiden Ricket and Layla Kegg chipped in with two points apiece. After a make up game with Fairland on Tuesday, GAHS will conclude its regular season on Thursday at Chesapeake.